"Swiss Open" redirects here. For other uses, see Swiss Open (disambiguation). The Omega European Masters is the Swiss stop on professional men's golf's European Tour, and in 2009 it became the first event in Europe to be co-sanctioned by the Asian Tour. Founded as the Swiss Open in 1923, the tournament was prefixed with European Masters in 1983, before dropping Swiss Open from the title in 1992. During the 1971 event, Baldovino Dassù became the first player to score 60 for 18 holes on the European circuit. 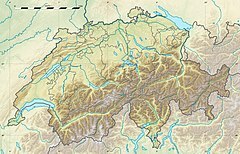 The tournament has been held at the Golf-Club Crans-sur-Sierre at Crans-Montana in Valais since 1939, and is currently played in early September each year. In May, 2006, Michelle Wie, who has a sponsorship contract with Omega, accepted an invitation from the company to play in the 2006 tournament, making her first attempt to play on the European Tour. At the September event she shot 78-79 to finish 15-over-par over two rounds and finished in last place among the 156 competitors. European Tour executive director George O'Grady said on September 8, 2006 that Wie's appearance was "an experiment" and he would need "a lot of persuading" before inviting Wie to participate in such an event again, despite record crowds estimated at 9,500. ^ "Omega European Masters makes further golfing history". PGA European Tour. Retrieved 12 January 2015. ^ "Wie accepts European Tour invite". BBC Sport. 15 May 2006. Retrieved 8 January 2009. ^ "Wie's tour future in doubt after second-round 79". Irish Examiner. 9 September 2006. Retrieved 8 January 2009. ^ Donegan, Lawrence (9 September 2006). "European Tour chief calls a Wie time-out as teenager crashes". London: The Guardian. Retrieved 8 January 2009.